We are picking a variety of lettuces, arugula, chives, baby chard, kohlrabi greens, radishes and kale from our garden these days. Every day we sit down to a humble feast! There’s something about eating fresh out of our backyard bounty that makes us feel like royalty. Is it knowing we’re eating such healthy and fresh food? 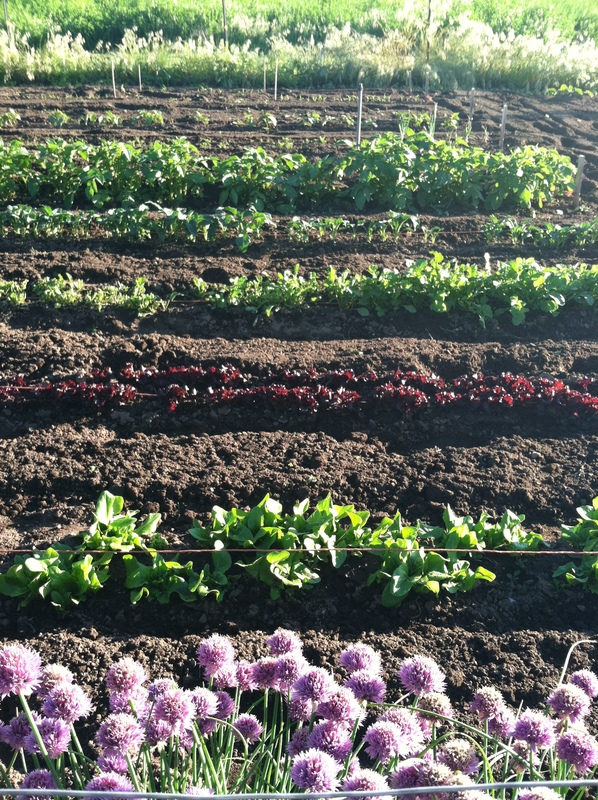 Or are we reaping the benefits that the loving labor of gardening demands? Could it be the fact that we are living with abundance at little cost and sharing our abundance with others? It’s all of the above…and more. Those of you who revel in veggie gardening know of the deep satisfaction I’m talking about. This spring has been wetter and colder than normal. Actually, here in the PNW that’s been the case the last 3 years. I think maybe our “normal” is changing. Consequently, our garden had a late start. Even still, with the few fresh picks available right now, we were able to mix things up without feeling like we were eating the same thing every night. Having said that, we never get tired of a crisp, freshly picked garden salad and enjoy it twice daily through this season! Here is a sneak peek of a weeks worth of eating from the garden at this early stage of growth. We also like to get our greens early in the day by blending up a green smoothie made with kale, baby swiss chard, lettuces and fruit. Here we go…. We had our grands over for dinner on the night we served this. They will always eat pasta and chicken sausage. I made a low-fat “sauce’ with leftover hot pasta water and parmesan cheese and salt and pepper in a large bowl. 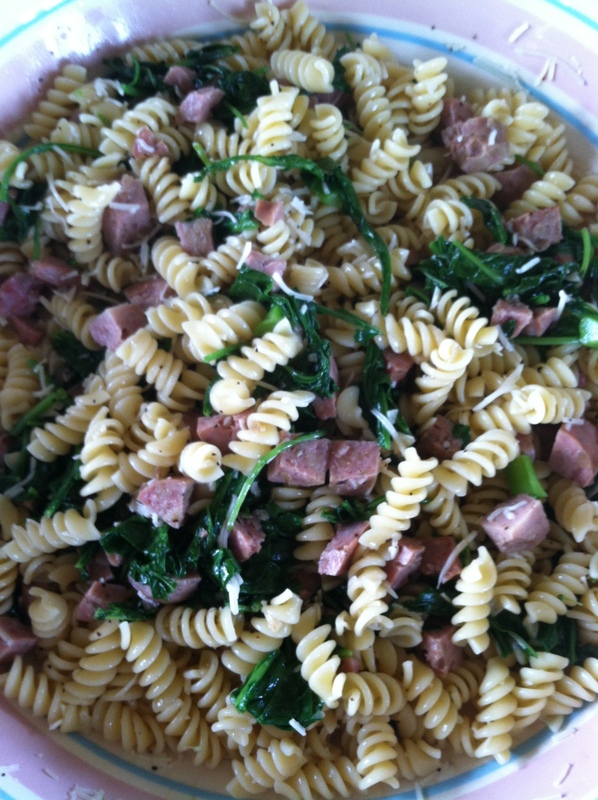 I then mixed in the hot pasta, browned chicken sausage and wilted arugula (8 cups!) in with the cheese mixture. 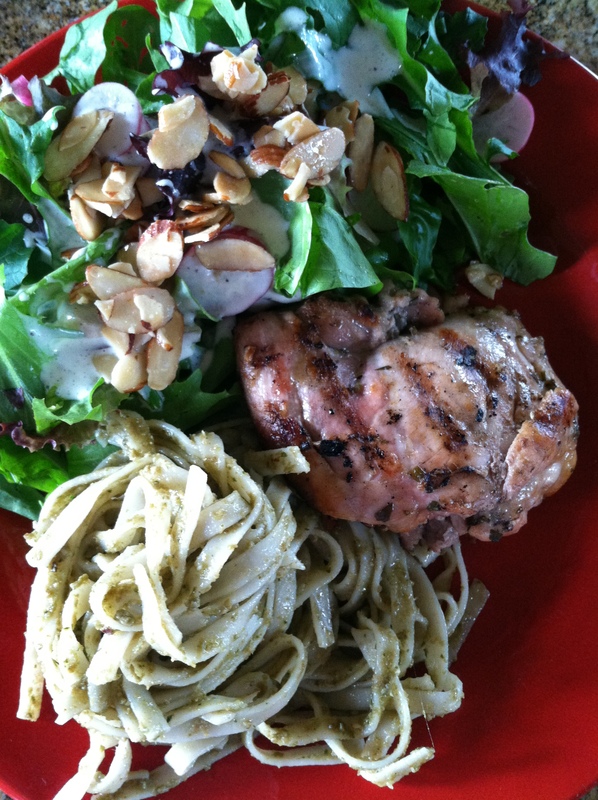 With all of the fresh spring greens we have, an added fresh salad was a no-brainer. After having thinned our kohlrabi that morning, I sautéed the mass of greens for dinner with carmelized onions in garlic. 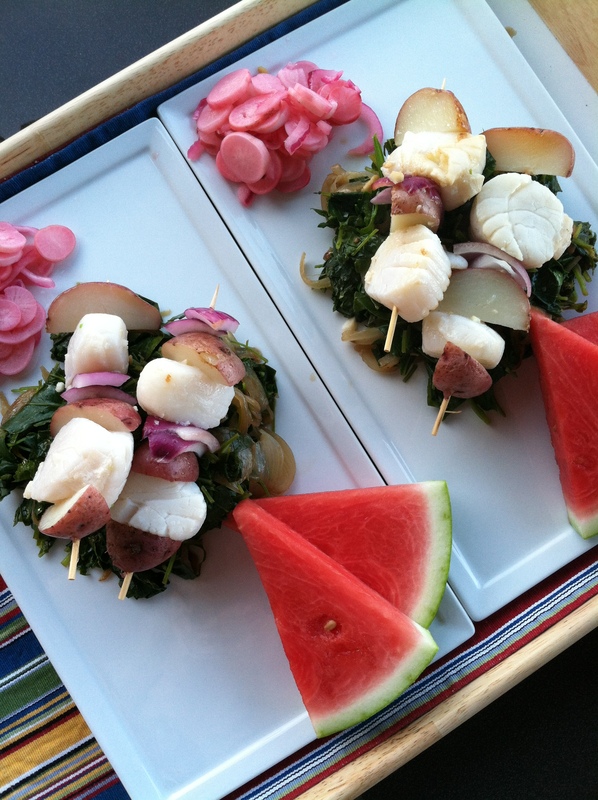 I served the grilled skewered scallops with what I had on hand, red potatoes and onions. Wedges of watermelon and Lazy Day Radish (June 19th post) pickles added something fresh to the plate. …our Father’s Day celebration with our “in town” son-in-law, daughter and kids. So proud of all the dad’s in our family. We’re blessed!! So fun!Homemade Whole Wheat crust, an herb and capers foundation for the shrimp pizza’s and fresh tomatoes on the arugula pizza. Grilled the pizza’s on a stone in our BBQ. Dinner was topped off with my husband’s favorite, root beer floats! I guess we were ready for a vegan meal. This was Jack’s pick. On the way home from work, he suggested the Portobello sandwich for our evening meal. He makes me smile when he chooses simple, vegan food. He does it without much thought. That’s what puts a smile on my face. The barley salad was made over the weekend. Having a whole grain / main dish salad at the ready in the summer is so convenient for a quick addition to a meal, a wholesome snack, to pack for lunch or for when the house fills up with hungry family looking for a quick bite. It gives them something ready and healthy to eat, now. We put a little olive oil on the Portobello’s, salt and pepper and grilled them for 10 minutes. 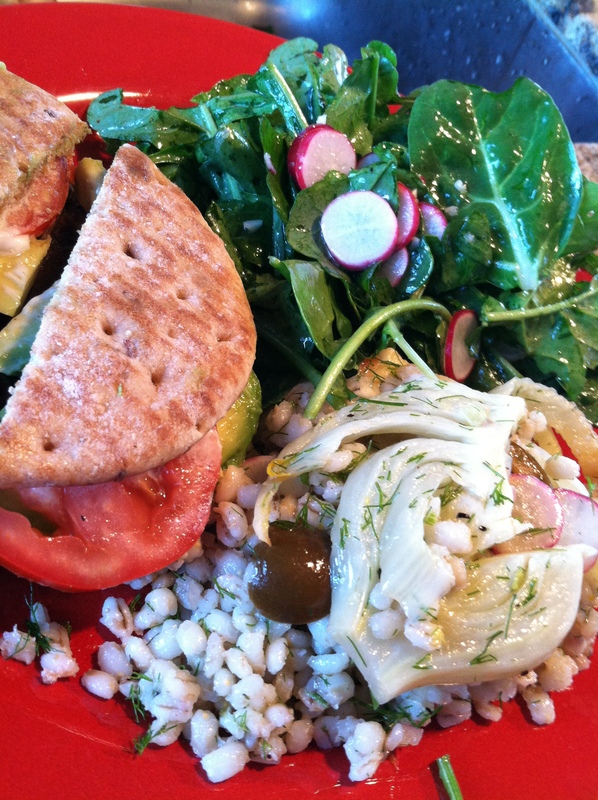 Decked out on a bun, with lettuce, tomato, avocado and veganaise, they were scrumptious! Cooked beet greens left from thinning our beets earlier in the day were a nice addition to this garden to table menu. 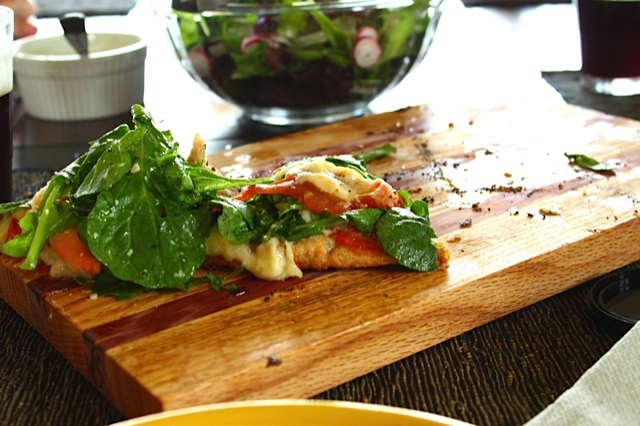 When arugula comes on, it comes on all at once and you have more than you need! It has to be cut fairly soon or it will go to seed. That’s the time to make arugula pesto. I make it in batches here and there and freeze it in ice-cube trays, bag them up, and store in the freezer to use throughout the winter months. It’s delicious as a sauce on pasta or added to soups. And it’s also great with salmon! I had leftover caper and herb sauce from the pizza night that I used to marinate the chicken in. All in all it was a very satisfying meal. One of our daughters told me about this idea she saw on Pinterest. She knows how much lettuce we grow, packing a salad almost daily for lunch through the summer. So far I have used an olive oil, lemon and garlic dressing and the vegan peppercorn ranch dressing (June 5th post) successfully in this layered salad in a jar. I’ve added an assortment of veggies with lettuce and homemade pickles. We like some crunch on our salads topping them with toasted nuts or seeds. We pack them in a separate container for lunch. On this particular day we layered in the leftover grilled chicken from the night before. These can be made 1 to 3 days ahead! We just empty the contents into a bowl, top it with a crunchy topping and savor every bite. This is my go to meal when I don’t want to put much thought and energy into dinner. It’s very satisfying without being high maintenance. 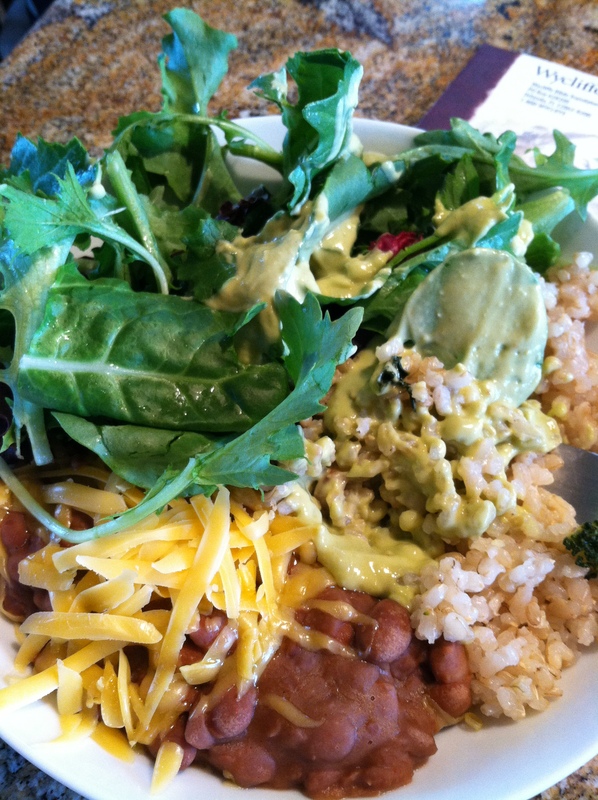 It’s the Creamy Crockpot Pinto’s (May 21st post), cooked brown rice (or quinoa), fresh salad greens, salsa and an amazing and quick avocado sauce. This is what we had garden-ready to create meals this week. It will change and hopefully I can update you with future From Garden To Table posts. I’d love to hear how you are using your fresh garden produce. Stay tuned for Marinades, Sauces and Salad Toppers which will include some of the above recipes. Yum! Would love to have you cook for us daily!! I think you do a great job cooking for your own family Kyah! 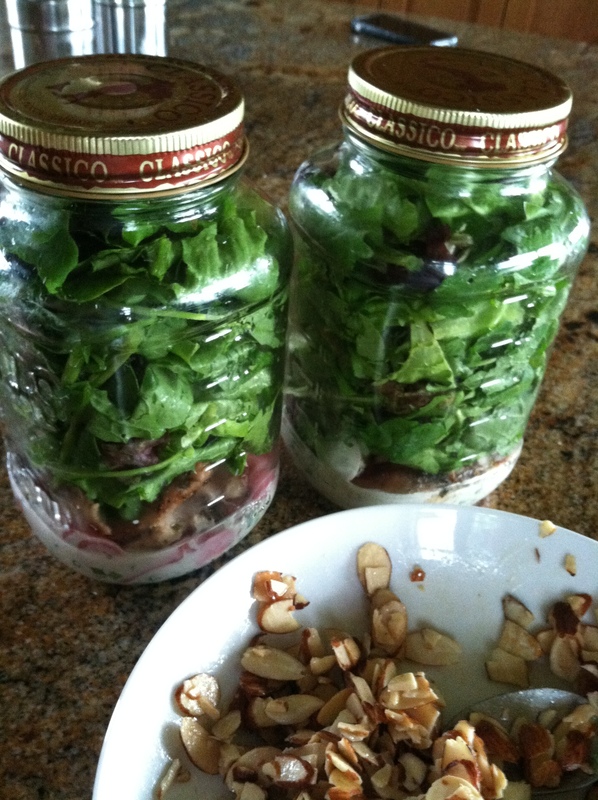 You create some really tasty concoctions that are beautiful and healthy. Kyah – the food and the pictures look amazing!